Along US Highway 90, in the Heart of America’s Wetland near the Gulf Coast of South Louisiana, is the thriving city of Houma. Houma lies in the parish of Terrebonne, which means “good earth,” named by Acadian settlers. And throughout Houma, Terrebonne Parish, and its surrounding communities, visitors will discover many good things: good people, good food and good times! The Bayou Cajuns are a hard-working and prideful people and arguably the most hospitable in the country. Their lives are centered on family, friends, fun and food! The local cuisine, be it gulf shrimp, jambalaya, or Creole gumbo, is not only unique but tantalizes the taste buds and satisfies the senses. Food is the spice of life in bayou country! The good times are never far away! Houma offers an array of entertaining activities for everyone year-round. For the sportsman, there’s chartered fishing and marshland hunting, where wild game abound. 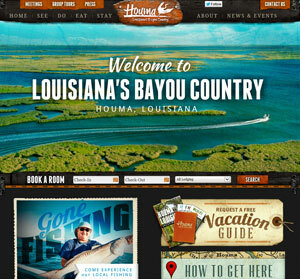 Houma is truly a Sportsman’s Paradise! The area of Houma-Terrebonne also provides stimulating scenery for tourists, with guided swamp tours, oak-lined plantations, and strolls on historic downtown Main Street. Main Street is also the heart of Houma’s spirited nightlife and world-famous Mardi Gras. Whatever your reason for coming to Bayou Country, we know you will find an unforgettable blend of not just the people, food and fun, but the customs, traditions and ceremonies that are historically ours. Add to this list the Houma-Terrebonne Civic Center, and you have every reason to visit our city! Please take a sneak peek into the local flair and flavor, courtesy of the Houma Area Convention and Visitor’s Bureau.